Climate change “solutions” must demonstrate effectiveness | Mothers Against Wind Turbines Inc.
Our technical consultant, William Palmer, using IESO (Independent Electricity Supply Operator) data, found that in 2014 hydraulic generating stations (water power) were reduced by 3.2 TWh (Terra Watt Hours) due to surplus base load generation. Bruce Power nuclear units were reduced 588 times, each occurrence resulting in bypassing some 300 MW of electrical equivalent of high pressure steam directly to the turbine generator condensers [Read William Palmer’s report here] . These transient adjustments result in accelerated wear on the condensers. 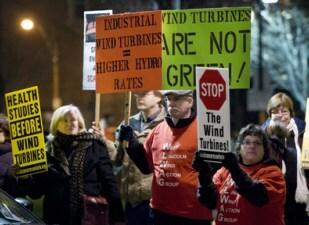 Previous PostTown Wants to talk TurbineNext PostShirley Wind – Opportunity for social justice missed. It will not be the last word.